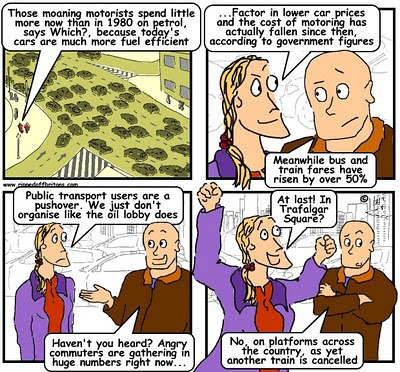 By Alexandra Woodsworth,campaigner at Campaign for Better Transport. Britons are already some of the most ripped-off in the world when it comes to rail fares. The UK’s railway is fragmented and up to 40% less efficient than its European counterparts, making it highly expensive to run. Passengers are paying the price for this inefficiency. Fares have been steadily increasing over the past twenty years, with some season tickets now costing the equivalent of a fifth of the average UK salary – and unfortunately it’s set to get much worse. The government has decided to raise the cap on regulated rail fares from 1% above the RPI inflation rate to 3% above RPI from January 2012. Inflation is still running high, which means that tickets are on course to rise by 28% over the next four years, or over £1,300 more for some season tickets. With millions of workers facing pay freezes, rail fares are now increasing four times faster than wages – making the cost of doing a day’s work increasingly unbearable. Government figures show that the planned fare increases from 2012 are likely to result in fewer people using the train. Instead of managing the railways as an essential public service, open to everyone, trains are in danger of becoming a luxury affordable only to the rich. This isn’t just a problem for fed-up passengers. Access by affordable public transport to limited jobs is essential to the health of the UK economy, and reducing this access undermines the Government’s objectives of getting people back into work. We are running the risk of pricing people out of the labour market in London and our other major cities, and damaging the UK’s competitiveness in a global marketplace. Claims of ‘green government’ are also ringing hollow, as – even with high petrol prices – driving becomes the cheaper option than going by train. The Government says that these fare rises are needed to pay for investment in new trains and other improvements. But in most cases, passengers are paying vast sums now for changes that are many years off, or will in fact never see the benefits because the investment is taking place on routes they never use. 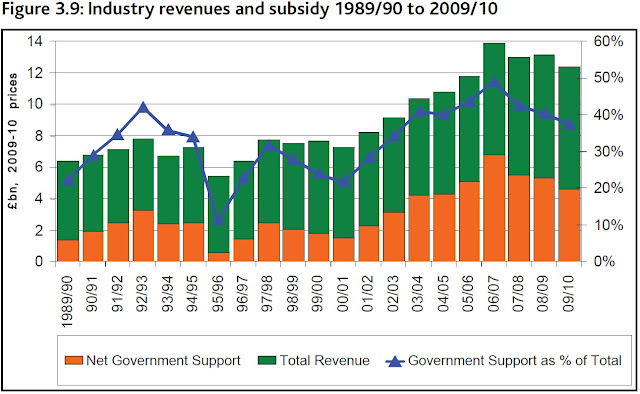 At any rate, this is a spurious argument: the improvements the government has committed to are already in the budget. In reality, raising fares is an austerity measure designed to reduce government spending on the railways, and shift the burden further onto fare-paying passengers. In recent years, the split has been about 50/50, and the government has said that passengers should pay 75%. But with fares already rising above inflation each year, the government’s contribution is falling steadily, and the chart below shows that we are on course to reach the government’s target, without the need to lift the cap to RPI+3%. So how can these hikes be justified? Some scream that taxpayers shouldn’t pay a penny towards a service they don’t use. These critics conveniently overlook the fact that public services like the railways don’t only provide benefits to those who use them. Railways provide a host of social and environmental goods, and help to deliver a range of the government’s objectives, that must be recognised when addressing the question of who should fund them. This is recognised by many of our European counterparts, where state support has helped to create modern, efficient, affordable railways. Here in the UK, fares regulation – established to protect passengers from the profit motive of private companies, and ensure affordable travel by public transport – has been turned on its head and is being used to make money for a government that promised fair fares when it came to power. Just how much money is currently impossible to fathom. The rules on fares and funding are labyrinthine and not understood even by industry experts, and fare revenue data (how much is raised, on what routes, and who it goes to) is deliberately withheld from public access, making it impossible to hold both government and train companies to account. And passengers facing huge hikes in regulated fares shouldn’t look to the train companies to be magnanimous and fill the gap by providing other kinds of affordable tickets – historically, unregulated fares have risen much more sharply than regulated tickets. Squeezed in the middle, passengers are rightly outraged; not only at what rising fares will do to their household finances, but because they don’t seem to be getting anything in return. Overcrowding, delayed and cancelled trains, cruel and unusual penalty fines – it’s all bad enough, let alone having to pay hundreds of pounds more each year in return for the privilege of being packed like a sardine on a train that often won’t even get you to work on time. Commuters more used to muttering under their breath or firing off a sarky tweet are being galvanised. Over the summer, they descended in their hundreds on train stations across the country, protesting for fair fares and gathering signatures on a petition demanding that the government reverse the planned fare hikes. But the true commuter rage is likely to be seen in January, when passengers turn up at the ticket office and find out just how much more they’re being ripped off this time. 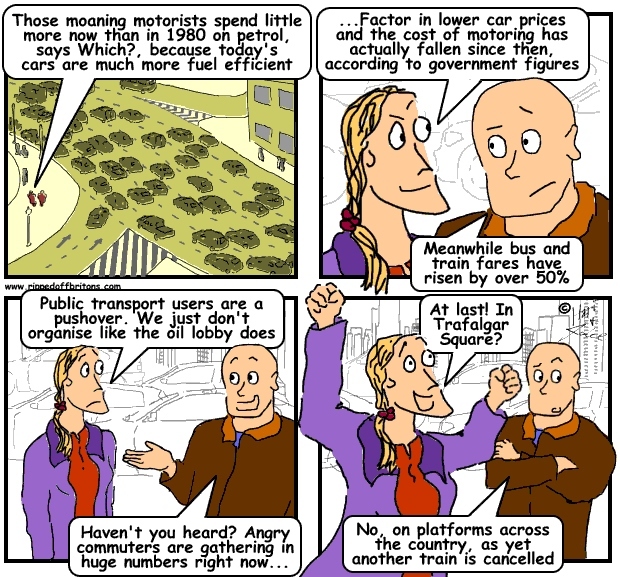 Alexandra Woodsworth is public transport campaigner at Campaign for Better Transport. Transport Minister Philip Hammond confesses the whole railway is already "a rich man's toy" with "eye-watering" prices. "People who use the railway on average have significantly higher incomes than the population as a whole – simple fact." And fares are going up by 8% per annum for years to come. Report in the Daily Telegraph newspaper: "British commuters are paying nearly 10 times more in rail fares than passengers in Europe, a study has found." We are prisoners in our own counties. These prohibitive prices mean that only the highly salaried, or the very rich, can afford to commute or venture by train outside their local environs. This means, that if we fall below a certain income bracket (not even that poor), we get out less, see less, and generally starved of movement, stimulus and diversity that travel affords. To commute more than 30 miles outside London is a impossible on an average or even slightly above average salary. Moreover, we are penalised for travelling to work by extortionate hikes in fares at 'peak' times. That is iniquitous. Perhaps the best way for this country to get itself back on its feet, is to aid it back to its seat, an affordable one: ease of transport, affordable and efficient: SUBSIDISE THE RAILWAYS, not wind farms and banks. Gee, folks, maybe you should look back at the ill-considered, ideologically-driven decision(s) to semi-de-nationalize the railway system!